This yellow flyer, about 7" x 4" was at the bottom of the box, I missed it on the first pass. It just reiterates who can participate, and who cannot, and again summarizes the simple instructions. They're really working hard at making this as easy as possible to complete. "In order to receive your bonus check, Nielsen must receive your completed diary within three weeks of the "Finish" date, which is indicated on your diary. 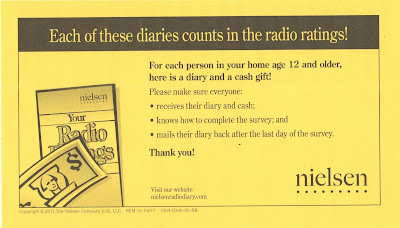 Payment for all members of the household whose diaries are received by Nielsen within three weeks of the "Finish" date will be mailed together as one check to the contact person at the household address. Distribution of the funds will be the responsibility of the household contact person. Bonus checks may be mailed by a third-party check vendor who will not try to sell you anything or ask you for money or sell/add your name/address to a mailing list. 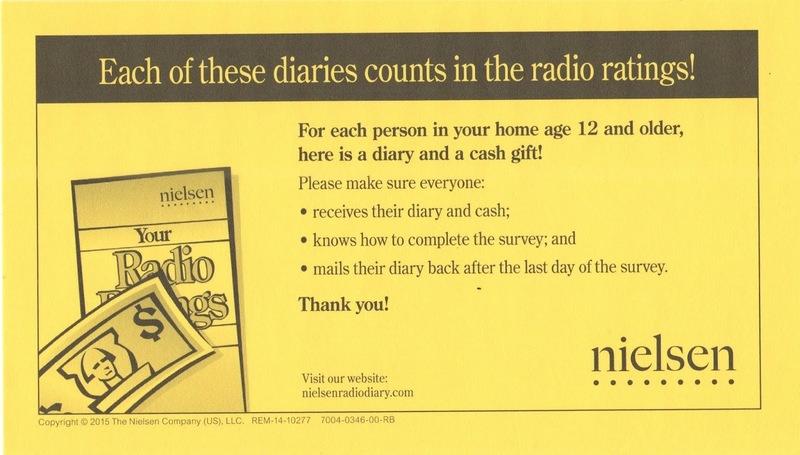 Checks will be shipped approximately six to eight weeks after Nielsen receives your completed radio ratings diary. Nielsen is not responsible for lost, late or misdirected mail. LIMIT ONE DIARY PER PERSON. Duplicate returned diaries will constitute fraud. Theft, diversion, reproduction, transfer, sale, or purchase of the bonus offer or the accompanying diary is prohibited and constitutes fraud. 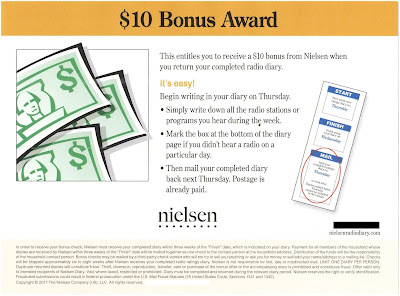 Offer valid only to intended recipients of Nielsen diary. Void where taxed, restricted or prohibited. Diary must be completed and returned during the relevant diary period. Nielsen reserves the right to verify identification. Fraudulent submissions could result in federal prosecution under the U.S. Mail Fraud statutes (18 United states Code, Sections 1341 and 1342)." That last claim is a bit obtuse. Section 1341 is for "frauds and swindles" essentially obtaining money or property by means of false or fraudulent pretenses. This protects Nielsen in the rare scenario where you fake or copy some portion of the diary to defraud Nielsen. Somewhere out there is someone who would do that for $10. Section 1342 specifically addresses any fictitious, name, title or address. So reasonably no responding under a fake name. Neither of these prohibits making copies of the documents as Nielsen intimates.